You don’t order ribs at a place called the Pizza Parlor. But my research told me that they made good ribs and an excellent homemade BBQ sauce at this dive bar in this decidedly blue collar section of Topeka. An adventurous place to eat is one of the few joys of modern day travel. I’ll give anything a try. Once. To be honest, the ribs weren’t terrible. Just not the epic, t-shirt buying variety. While they were tender, they had no traces of being smoked. No tell-tale dark pink smoke color. No smoky flavor. Folks, boiled ribs ain’t BBQ. And the baked beans came from industrial-sized cans of Bush’s Baked Beans – I passed them on my way through the kitchen to use the men’s room. 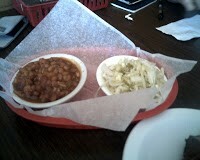 The coleslaw was at least unusual, though in a weird, vinegary sort of way. 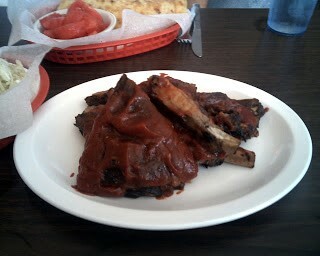 The highlight was the globs of thick, red BBQ sauce on the ribs. I know some BBQ snobs would be absolutely aghast at the sight of all this sauce that looked more like ketchup covering their ribs. But I can be open-minded when I want to be – at least when it comes to BBQ sauce. In eastern North Carolina, I’ll gladly add a few dashes of their vinegar-based sauce. In Columbia, I’ll pour on their golden mustard-based sauce. In Memphis, I’m happy to indulge in dry-rubbed ribs with no sauce at all. And in the Midwest, folks like their sauce thick, sweet, and tomatoey. So I deal with it. You can’t tell me a deliciously molasses-sweet sauce like the Pizza Parlor’s wouldn’t make even cardboard taste good. But therein lied the problem. The sauce alone saves the ribs. Although, maybe I was just grumpy over the fact that it was noon on a Tuesday, and I was the only one in the joint wearing a suit – and the only one not drinking beer. The scene was straight out of that Sheryl Crow song. 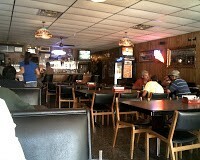 After all, Pizza Parlor is a classic, blue collar neighborhood dive bar—complete with $1 drafts of Pabst Blue Ribbon. And, no, that isn’t the happy hour price. That’s the regular every day, all day price. And if you’re a real big spender, you can get the Busch Light cans for $1.50. Busch-freakin-Light! In a can! It doesn’t get any more divey than that! So I made a promise to myself. Next time I’ll be prepared. 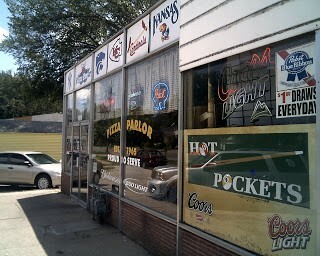 Next time I’m in Topeka, I’m changing into Wranglers and coming after work so I can drink $1 PBRs with the locals. And next time, I’m ordering the pizza.